C-EFE St. Kitts and Nevis – Sitting in Terminal 1 of Pearson International Airport, I have some time to reflect on the week spent delivering training in Prior Learning Assessment and Recognition (PLAR) at Clarence Fitzroy Bryant College (CFBC) in Basseterre, the Capital of St. Kitts and Nevis. St. Kitts is beautiful. Lush, volcanic mountains slope down to meet stretches of sandy white beach fringing the aquamarine expanse of the Caribbean Sea, but what stands out most for me is the level of energy, enthusiasm and engagement of the individuals I had the honour of working with throughout the week. Their efforts and engagement in our working sessions lead to the creation of a draft PLAR policy, an articulated PLAR process, and the creation of a draft assessment guide for the new Agri-Business Program which will be the flagship competency-based program at CFBC. Prior Learning Assessment and Recognition is a process whereby individuals can have their informal learning recognized for credit or certification. It is based in the recognition that learning takes place in many contexts outside of formal learning institutions. In the Caribbean region, PLAR has been embraced by the Caribbean Community (CARICOM), an organization of 15 member states, whose goal is to improve the standard of living and work, increase employment and ensure economic integration and cooperation in the region. The Caribbean Association of National Training Associations (CANTA) launched a PLAR policy in 2013 and since then have been working to implement this policy in the region. When Zoran Kondali asked me to travel to St. Kitts with NSCC International to deliver a PLAR training to staff at CFBC College I was excited but also trepidatious. Having worked in the area of PLAR for years now, I am aware of how challenging it can be to implement if an education system is not already outcomes or competency-based. I shouldn’t have worried! CANTA has done exemplary work towards building a competency-based system in the region, including the creation of the Caribbean Vocational Qualification. The workshop participants consisted representatives from CFBC, the Technical and Vocational Education Council (TVET), the Ministry of Education and the Advanced Vocational Education Centre and Project Strong. 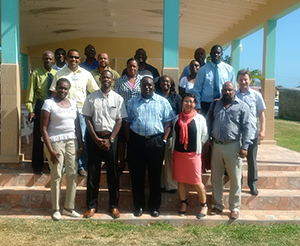 These key stakeholders worked collaboratively throughout the week to build a PLAR system that will serve learners throughout St. Kitts and Nevis and increase access to education and work. What a dedicated and passionate group! NSCC International is to be commended for the inspiring work they are doing throughout the world, building connections between individuals, schools, communities and countries, increasing the capacity of all parties to engage with, contribute to and thrive in our amazing, complex, and constantly changing world.